We see a lot of companies are moving towards a microservice architecture. 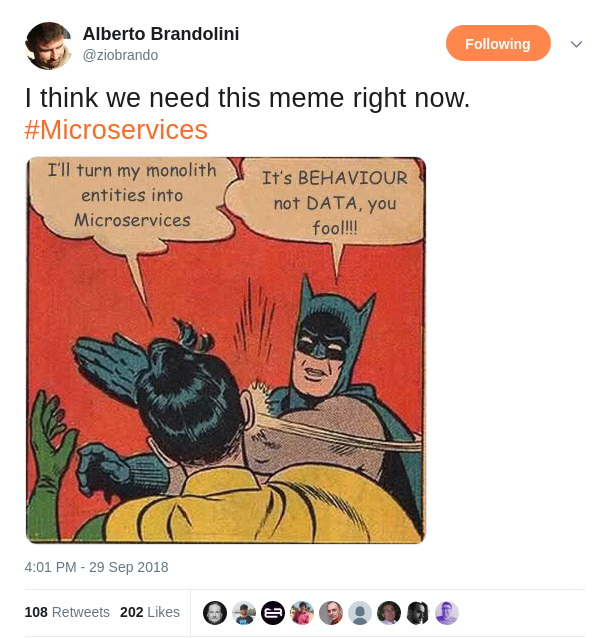 The big pitfall of microservices architecture is to focus on the technology, how big the microservice needs to be, how many lines of codes, what entities do we put in a microservice, and using rest as the communication between them. But to succeed we need to focus on the problem space, by crunching domain knowledge and do domain modelling. EventStorming is a perfect fit for domain modelling, and almost all the microservices leaders seem to agree. Even ThoughtWorks finally put EventStorming on ‘adopt’ in their most recent rendition of their technology radar. But EventStorming has grown to be more than just a tool for domain modelling and to be successful and create autonomous teams you need to use EventStorming for more than only domain modelling.